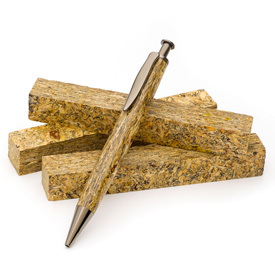 Pen Makers Choice™ Dakota Burl Pen Blanks are made from crushed sunflower seed hulls that have been impregnated with resin. The seed hulls are then bonded together under very high temperatures and tremendous pressure to form a stabilized and completely homogenous product that is easy to turn and finish. The unique pattern created by the seed hulls is beautiful, distinctly different from wood and makes a great conversation piece. Blank size: 3/4" x 5"
Comments On Mar 17, 2018:Great blanks for the baseball, softball & T-ball families.